Here is a "wine in a box" that we have had before from Franzia. It's a Sunset Blush that the White Wine Wino likes a lot. Red Wine Wino likes it too, especially given the price.... 5 liters of wine for around $10.00! This one maintains its "Good Rating". How about a Merlot from Red Diamond Winery of Washington State? Red Wine Wino will buy it again; Whtite Wine Wino agrees. This Merlot gets a "Good Rating"! ... "polished wine with softly-spiced black cherry, berry and plum flavors." Give it a try when you get a chance! Here is one from Italy's Bella Sera Winery. 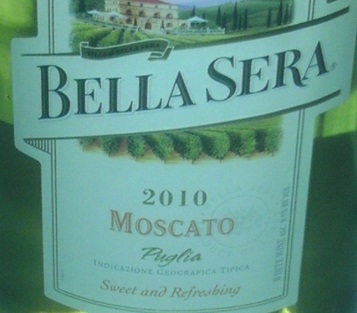 An offering in a Moscato that has both Winos agreeing to buy more in the future! Sweeter than Barefoot's Moscato but not too sweet to make it a dessert wine. This one gets a "Good Rating"! Here is one that we have had many times in the past. 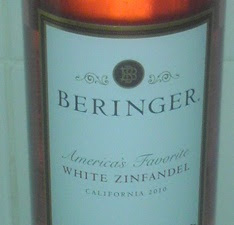 It is Beringer's White Zinfandel. White Wine Wino has a thing for Zinfadels; Red Wine Wino like it as well.... This one maintains its "Good Rating"! Another sale on Sweet Reds. 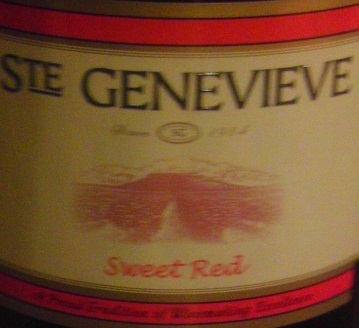 This one comes from Ste Genevieve Winery. The Winos agreed to purchase it again; so it gets a Good Rating. However, still holding fast on Liberty Creek's Sweet Red as the Number One Sweet Red purchased to date by the Winos! Here is one that took us by surprise. White Wine Wino was on an errand and came home with a bottle of Sweet Red from Liberty Creek Winery. 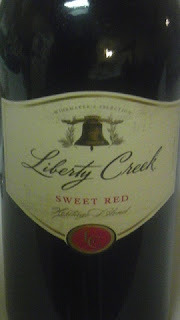 Have had other wines from Liberty Creek and liked them. In this case, liked it as well to the point that the White Wine Wino went back for more bottles to keep in the wine rack. Both agreed to buy again, earning a Good Rating from the Winos. 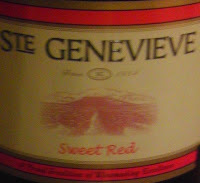 Moreover, the White Wine Wino rates this one Number One of Sweet Reds purchased to date! Red Wine Wino concurs! 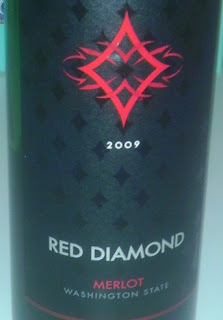 Don't pass this one up if you like Sweet Reds.